Pictured in attendance at the Illinois FBLA State Leadership Conference are FBLA members (from left) Emily Wiegmann, Abby Arentsen, Grace Fuehne, Lauren Kampwerth, Katie Toennies, Madison Stone, Phusana Sawannachote, and Jun Moon. 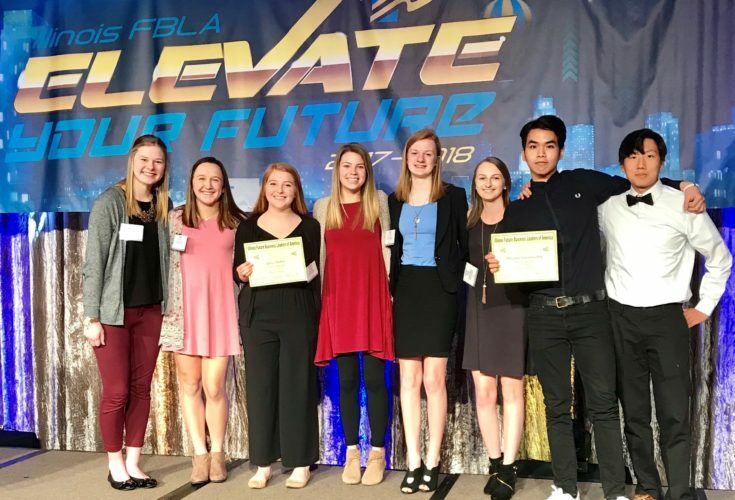 Under the guidance of moderator Mrs. Heather Land, twenty-one members of Future Business Leaders of America (FBLA) competed in Illinois FBLA State Leadership Conference competitions. We congratulate the following members who earned recognition: Ben Logullo – 3rd place in Computer Problem Solving, Luke Goebel – 3rd place Personal Finance, Abby Arentsen – 4th place Word Processing, Alexis Patton – 4th place Business Communications, Jun Moon – 4th place Spreadsheet Applications, Phusana Sawannachote – 9th place Securities & Investments, Grace Fuehne – 10th place Business Calculations, Jacey Wieter – 10th place Agribusiness. Additionally, Ben Logullo, Luke Goebel, Abby Arentsen, and Alexis Patton qualified to compete in the FBLA National Leadership Conference. We congratulate all members who participated in the Illinois FBLA State Leadership Conference!